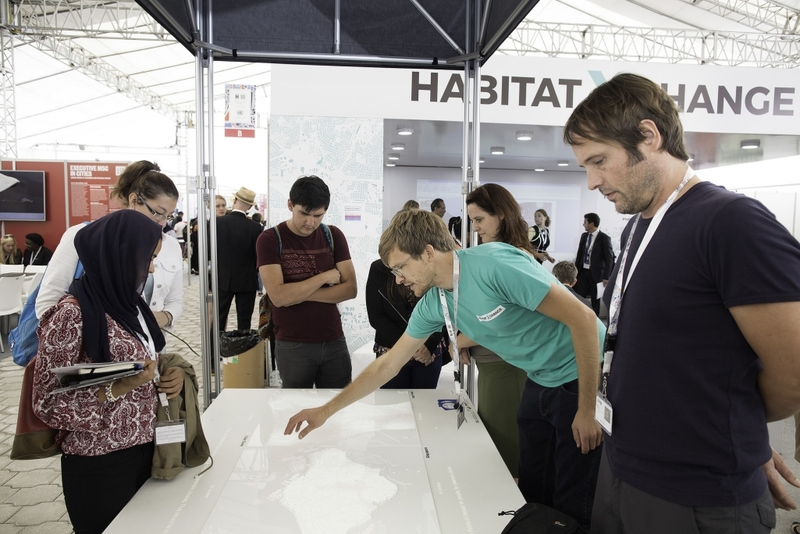 During the UN conference Habitat III in Quito, Ecuador, the International Council for Science, Future Earth and the Urban Complexity Lab of the FH Potsdam organized a unique event and exhibition space dedicated to the science and visualization of cities. Our aim was to create a vision of how cities will be shaped in the future. Photos by Johannes Mengel and Edu Léon. More impressions from Habitat X Change. The Habitat conference is an exceptional agenda-setting event. It is organized by the United Nations and takes place every 20 years. It is a unique opportunity for debates and explorations on urban development. 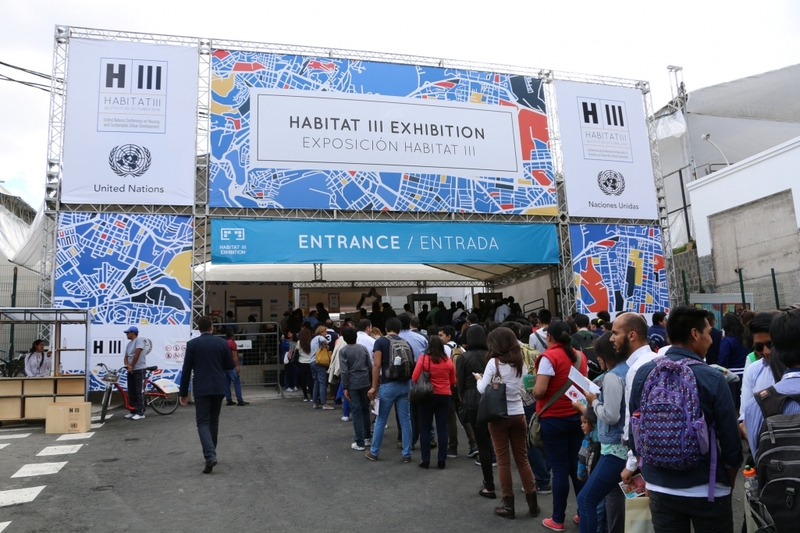 Habitat III took place in October 2016. 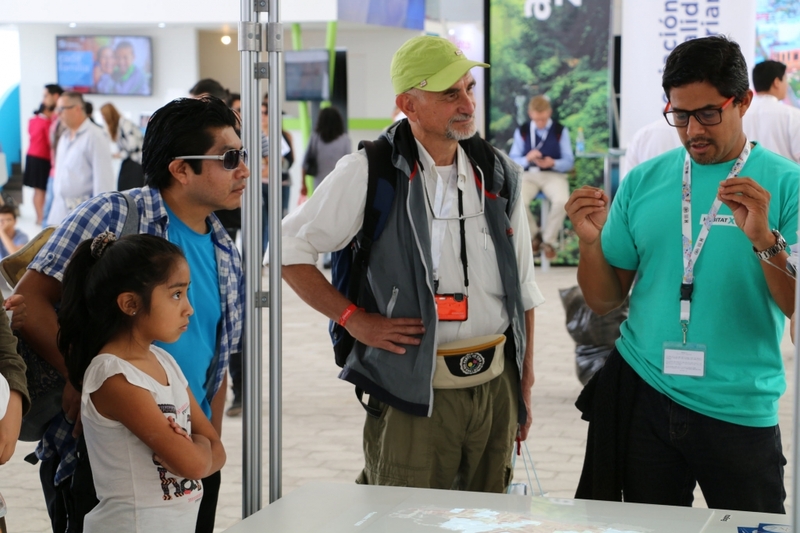 More than 40,000 people met in Quito, Ecuador for the largest cities summit in United Nations history. 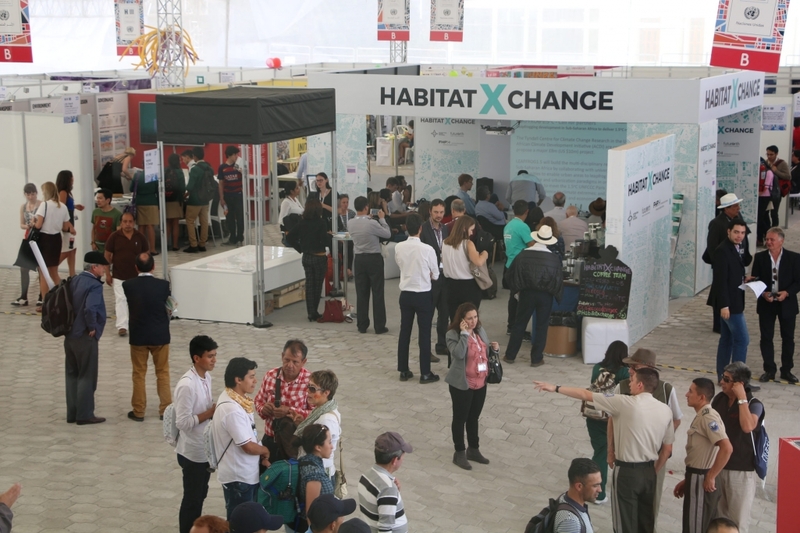 For Habitat III, the International Council for Science, the Future Earth initiative, and the Urban Complexity Lab with support from HERE launched the collaborative space “Habitat X Change”. Our aim was to connect scientists, policy makers, and visualization designers to jointly work towards a better future for cities. 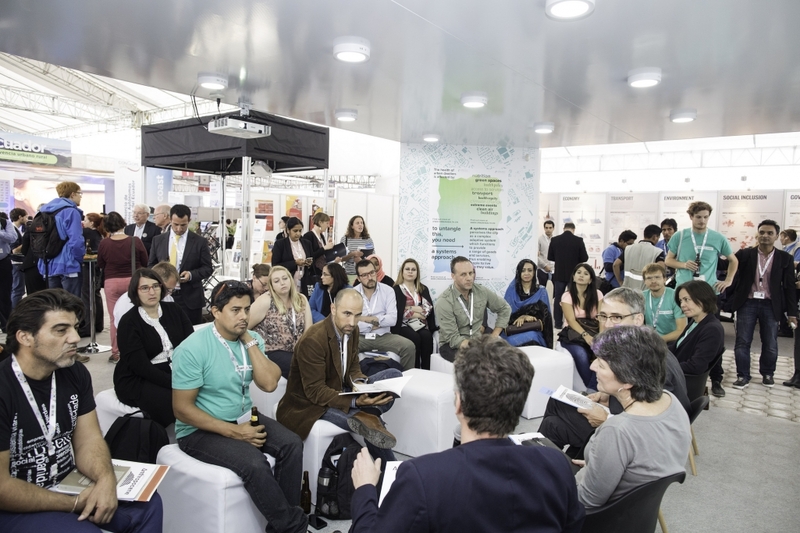 The ambition to connect the dots between the communities resulted in a packed line-up of events and an exhibition of cutting-edge visualization projects on cities from around the world. Our contribution to Habitat consisted of three projects: the Habitat X Change Space, the visualization module “VisTent” and the international competition “Visualizing Cities”. 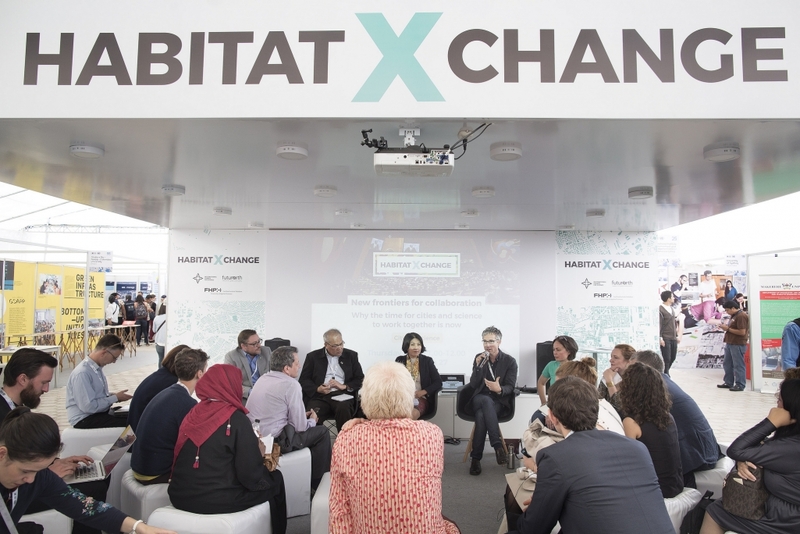 The Habitat X Change space hosted a series of talks, panel discussions, workshops on cities, science, and visualization. Speakers from around the globe discussed the futures of cities and shared their perspectives on upcoming challenges in our quest for a better urban future. 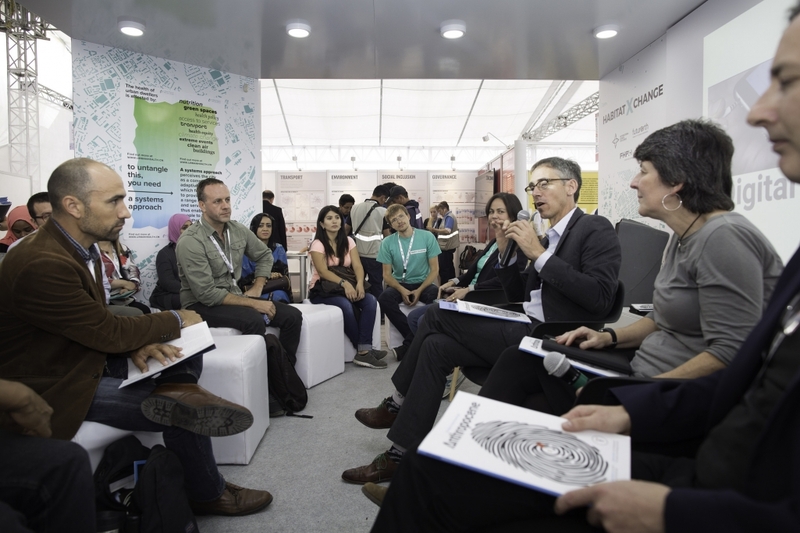 Combining perspectives from academia, industry, and civil society, a broad discourse fostered knowledge exchange between the diverse communities concerned with cities. In order to foster debate, a prominent visualization module was used in the Habitat X Change Space: The VisTent is an installation for visualizing urban data using top-projected city models. It brings together the physical character of city models and the dynamic quality of data visualizations and it is an excellent enabler for debates on urban development. 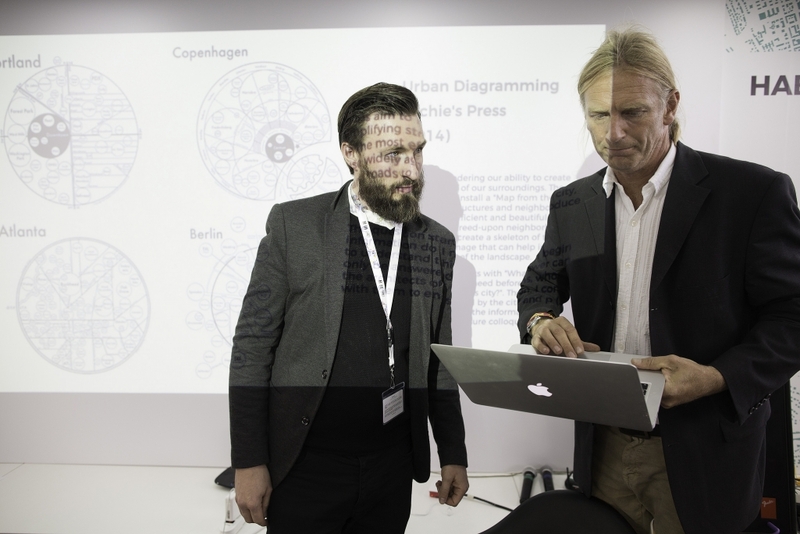 In addition to the activities in the physical space of the Habitat X Change Space, the team nurtured a transdisciplinary discourse around science, cities, and visualization via the international competition “Visualizing Cities”. Visualization is increasingly recognized as an essential tool for analysis, exploration and communication of large datasets. It has become a key tool in the task of unravelling the complex fabrics that form our cities. The Visualizing Cities competition launched as an open platform in the summer of 2016 and invited the public to contribute innovative visualizations that could help us make sense of our transforming cities. The call attracted over 100 visualization projects from around the world on a wide range of issues. All entries are available at cityvis.io. 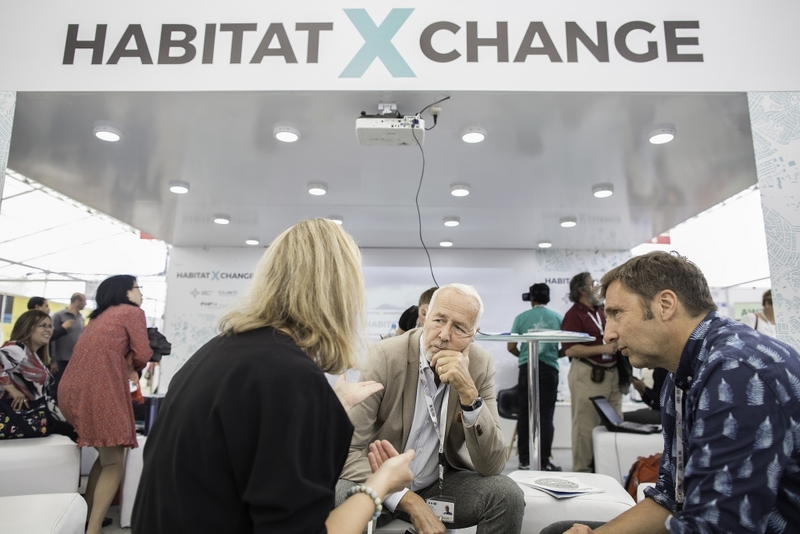 For us, the Habitat X Change project was an amazing opportunity to engage with an international community of politicians, planners and deciders – but also with citizens, scientists and designers. We were able to demonstrate the power of visualization as a powerful tool for understanding the complexity of urban development – but also as a methodology to foster debate, communication and planning.